The Turquoise Parrot is similar to the Scarlet-chested Parrot. It is the females which could most easily be confused, as the males are more distinctive. The female Scarlet-chested Parrot has a more extensive cobalt-blue face than the female Turquoise Parrot. The Turquoise Parrot is found from south-eastern Queensland, through New South Wales to eastern and north-eastern Victoria. The range was formerly more extensive. The Turquoise Parrot favours open, grassy woodland with dead trees near permanent water. It also inhabits coastal heaths and pastures with exotic grasses and weeds, along roadsides and in orchards. Turquoise Parrots are generally resident in an area, but some local seasonal movement occurs. 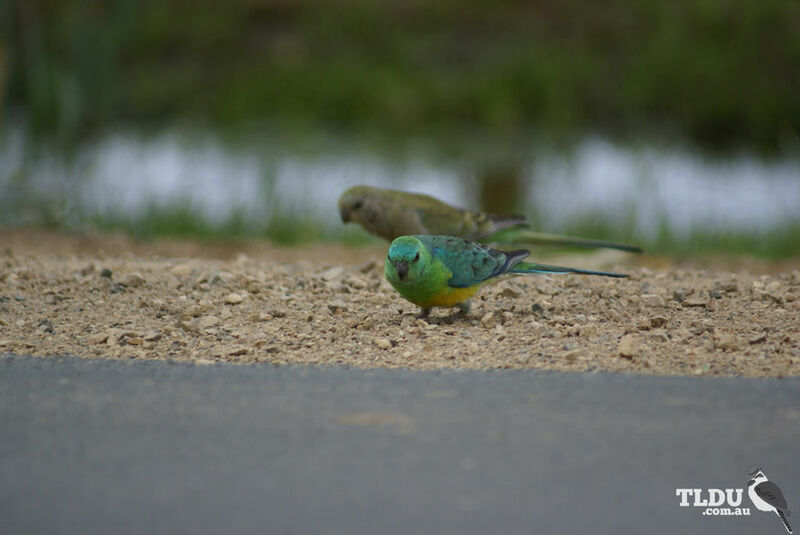 Pairs or small parties of Turquoise Parrots forage mostly on or near the ground for seeds of grasses and shrubs. They also eat flowers, nectar, fruits, leaves and scale-insects. The Turquoise Parrot nests in vertical or near-vertical hollows in living or dead trees. The eggs are laid on decayed wood-dust or fine wood-chips. Leaves and grass may also be brought to the nest by the female. She carries these by tucking them under the feathers on her rump. Sometimes two clutches are laid in a season. Only the female incubates the eggs, but she is fed by the male who will also later attend to the chicks. The Turquoise Parrot is considered vulnerable in New South Wales, and threatened in Victoria, after having been considered extinct in the wild by 1915. The population began to recover by the 1920's. They had formerly been caught in large numbers for the cage bird industry, and were also shot for food, as a pie-filling. Their original habitat in western Sydney - the Cumberland Plain Woodland - is the most cleared of any vegetation community.